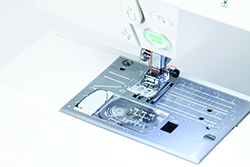 The computer sewing machine DC 7100 provides the amateur seamstresses much comfort at a reasonable price. The clear LC display, stitches can be retrieved and change individually if necessary. Give 14 direct keys allow quick access to 10 popular stitches and four buttonholes. A total of 100 stitches are programmed. A pluggable Overview quickly leads to stitch. With the threader and the new reel Fast insert the DC 7100 is ready to sew shortly. 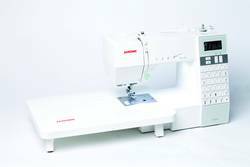 Functions like Needle Stop Up / Down, Punktvernähen and electronic thread scissors are next to the start / stop button and the infinitely variable regulation of sewing speed as to the amenities such as the twin needle control and an elongation-dial button. The gap is actually programmed. Thus, the machine will automatically cut the threads after sewing. With the machine comes rich accessories, a toggle and a large extension table. So does the DC 7100 sewing even more fun. Simply insert the coil, pull bobbin thread in the new leadership and no bobbin thread pick los sew.